Furious Fred de Fillet's Castle is the final level of World 4 found in Yoshi's New Island. Yoshi starts the level in a castle with some enemies and a nearby door which leads to an area with some more enemies and eventually the Checkpoint Ring. 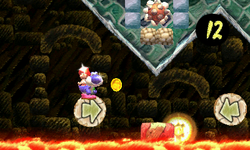 In this area, Yoshi must ride some Arrow Lifts while avoiding lava and enemies to reach the boss door where Furious Fred de Fillet awaits. When hit three times, Fred is defeated and the player can go on to the next world.